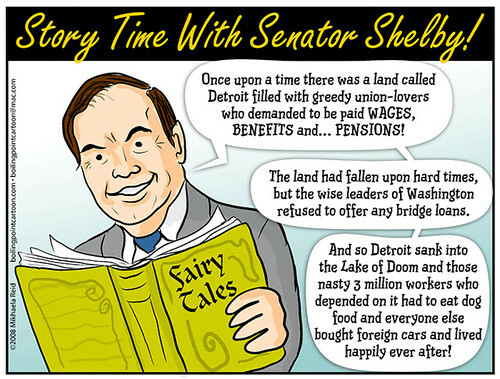 I drew this last week when the bailout was expected to fail and the lead advocate of that failure was Senator Richard Shelby of Alabama--home to plants for several foreign auto makers. 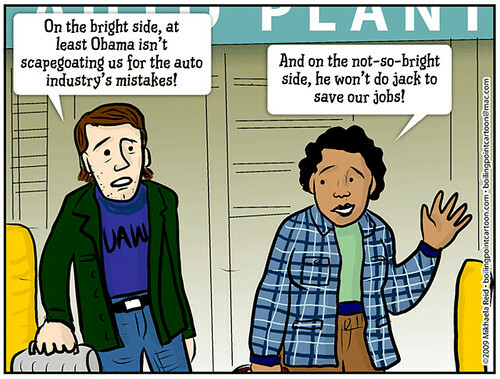 So yeah, I do support an auto bailout, if it actually involves a radical retooling of what the domestic auto makers make and do. Sure, the leaders of the Big Three are a bunch of morons, but why should so many millions of workers have to suffer for their sins? And stop blaming the unions! Grrr!!! 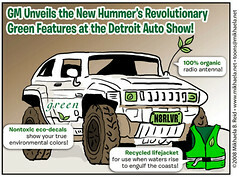 Seriously, GM actually unveiled a new "green" HUMMER at the Detroit auto show. But a little ethanol usage does not an environmentally friendly monster SUV make. We've got to rethink transportation on a much deeper level than that.